Help a survivor of the monastery fire exact revenge. Muth Gnaar — Help the Muth Gnaar monastery survivors. Tennus Andalen/Relnus Andalen/Ven Andalen and his brothers want to take revenge on the Vereansu for killing their father, who was afflicted with the Llodos plague and was being cared for by the monks of Muth Gnaar. Talk to Tennus Andalen, Relnus Andalen, or Ven Andalen. Return to Tennus Andalen on the north road. 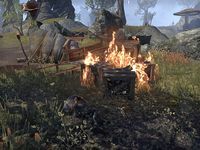 I see several crates of supplies around the Vereansu camp. I should set them on fire to exact revenge for the Vereansu's attack on Muth Gnaar. Finishes quest Now that the Vereansu supplies are burning, I need to find Tennus Andalen. He's on the road north of Muth Gnaar. I should tell him what happened. This page was last modified on 10 November 2018, at 00:09.